So the thing about fantasy films is that there’s only so much the general public will take. If recent decades are anything to go by, The Lord of the Rings and ‘Game of Thrones’ are most people’s limit. Once you get any further into high fantasy territory, audiences won’t be able to see past the silliness. And that’s probably why we haven’t been subjected to a real sword and sorcery-type flick since the early 80s. Then along comes Warcraft, a film about orcs written and directed by the Goblin King’s son, Duncan Jones. And it dives headlong into full, unadulterated fantasy territory. Not only are we expected to sympathise with CGI orcs and human knights in shiny armour, we have spellcasters creating lime green cosmic portals to other dimensions. 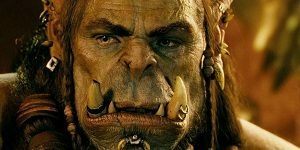 For better or worse, Warcraft embraces its fantastical setting and isn’t shy about dialling it up to 11. Which is great…but only for some. If you’re a fan of the world, then Warcraft is for you. I saw the film with a friend who’s been playing ‘World of Warcraft’ for over a decade, and he loved it. If you’re really into high fantasy, then this should excite you, if for no other reason than the fact these films don’t get made. For everyone else…I’m not so convinced. The thing is, Warcraft: The Beginning (if that’s what it’s called in your territory) is basically a war film. The narrative is at pains to portray both sides (something at which WoW has always excelled) and at the end of the day, it’s about the never-ending nature of conflict, the futility of war etc etc. Warcraft gets full marks for this. Ironically, the orcs fare better than the humans. Evoking sympathy for these monstrous green musclebound creatures was high on the creative team’s wish list, and they truly excel. Toby Kebbell’s performance as Durotan is probably the best of the lot, though Paula Patton gives her all, acting through some awkward-looking false teeth. When it comes to the humans, however, I was less enamoured. Full disclosure: I think Dominic Cooper’s a bit rubbish. Always have. 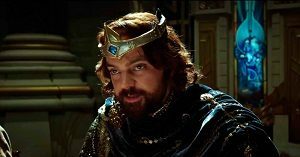 So once again I’m bemused at his casting as Llane Wrynn. Then there’s Ben ‘human spoiler’ Foster as Medivh, who isn’t playing anything outside his comfort range. They all look silly in costume, and one wonders if a 100% animated film would have been a better way to go. The action is decent, the visual effects are mostly good (only really falling flat when they need to show us human performers interacting with CGI characters. Visually, it’s all right, but as I said before, this looks like early 80s fantasy most of the time. Think Conan, Red Sonja, Willow, Legend – there’s nothing washed-out about the footage here. The score is decent, but only has a single theme that sticks in your head after you walk out of the cinema. This entry was posted in Film Reviews and tagged Action/Adventure, Fantasy, War by Stuart Wilson. Bookmark the permalink.